When I was finishing high school, my family decided to move in with another family that my sister and I were friends with. They had kids, the mom and their ancient schnauzer. We came with the three of us and our two cats. My mom never owned any of our homes, and we moved from rental to rental throughout our childhood. This time we made the move for several reasons: To save on rent, and to help out the other family’s mom who was being physically abused by her second husband. At least I thought those were the reasons. Looking back, it seems the idea was hasty and very unconventional, the type of decision my mom typically made on a regular basis throughout my childhood. It quickly became obvious that it was a disastrous move on many levels. Think about it: Moving into someone else’s home and taking over 50% of it. What were we thinking? What were they thinking? It was a large, opulent home for its time, lots of extra rooms including one room that was entirely powder blue. Walls, carpet, furniture, all of it plush and luxurious and hands-off except on Christmas day when photos were taken. The rest of our lives played out in the darker, scruffy sections where the dog chased the cats, and they scratched up the furniture in retaliation. All of the kids were left to more or less raise themselves, with the moms out either working or dating. Off the kitchen of this home was a large rec room with a pool table, lots of plaid sofas for doing nothing on, and the “piece de resistance“: A rustic saloon-style bar complete with filled liquor bottles from floor to ceiling. Needless to say, this room became a favorite spot for neighborhood teenagers. Unmonitored liquor access, a super stereo with giant speakers and a kidney-shaped pool outside the sliding doors. Hell yeah. Within this novelty bar there was a clock on the wall, maybe you’ve seen one like it in your travels? It was a popular gag item back then. 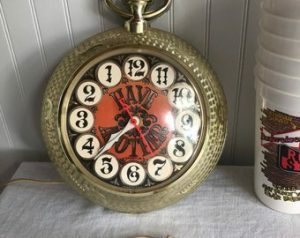 The clocks face was reversed, so the higher numbers were on the left and low ones on the right. Ha ha, funny right? This clock is a visual representation of my relationship with alcohol. Every time I think back to when it started, the clock keeps moving farther and farther back in time, for what I thought was supposed to be a forward moving journey when I stepped onto the train. Just when I think I have a grasp of our history together (me and the alcohol beast), another buried memory reveals itself. Just last week when an old friend went back to our hometown for her mother’s passing, she shared a bunch of memories on Facebook I’d completely forgotten, all sodden with Pink Catawba wine and other stolen bottles of booze. Her recollections took me back to a place I’d completely forgotten, and I’m still not sure if my mind has been protecting me or playing tricks on me. Every time I offered condolences to this friend, she replied with a funny ha-ha moment about cruising the strip drunk or something else involving getting tanked together. Again, not my memories. My personal story, up until the point of these posts, was one of relative moderation through my younger teenage years. I had put the start of drinking squarely on the shoulders of my college years. Sure, there were the times when I was younger that I’d chug some frozen concoction my mom had left in the blender, refilling it to its original level after I’d had my fill. But these were mild, occasional incidents, blips. Well, not according to my friend’s memories. The posts made me cringe, but more importantly, made me question what the heck was going on in my mind and causing me at this point in my life to question my life narrative. This journey of recovery, of peeling back the onion layers to reveal when my unhealthy relationship with alcohol took a firm footing in my soul, it’s complicated. As I work to move forward each day with my reading, sharing on the MM forum and others, and constant (almost at a maddening level) reflection of who I am and what I am right now, I seem to be moving backwards at the same time. It feels like a bull in a pen, waiting to be released with a cowboy tied to its back, thrashing about and trying to be free. I didn’t sign up for this part. I don’t like it, the analyzing of events and regrets and piecing together of memories to try to formulate a realistic picture of who I am, and then spending even more energy trying to be OK with what is being revealed. This is hard stuff, it makes my brain hurt and it feels too deep and selfish for what is supposed to be an open, f*ck-it time in my life, now that the kids are getting older and I’m supposed to have it all together. But here’s the thing: Getting sober is a really, really selfish act. It can feel indulgent, it can take time away from family or work. It can really mess with your social life, and is also excruciatingly boring at the same time. But like the backwards clock and all of the messed-up stuff I am dredging up in my mind to make sense of it all, I don’t want to be back there anymore. I actually want the messy, uncertain, unclear and really scary part of this, the part where I decide if abstaining is permanent, or moderation is doable and reasonable. I want it all, in it’s uncharted, hard and difficult way, because this new life is so glorious it hurts, but also makes me fly higher than anything I’ve done in a really, really long time. Hope, thank you so much for this. It really underscores that for most of us, this exploration of our relationship with alcohol is such a journey and a process. It reminds me to look back and remember how far I have come and to even appreciate that progress often comes in little bits over time. I too am not sure what my end goal is (abstinence or moderation), but I really have come a long way. Great read and to the point. It’s very realistic and gets me where it counts to read something like this. It will help me to stick to my guns. Thank you HopeL for sharing your story. Many people don’t even try or have the courage to tackle their issues in life. Like I said in one of my previous comments, its the difficult stuff, the hard earned that holds the most value for us in life. I have memories of crazy fun high school drinking times, even though most of them ended with me down on my hands and knees puking up cherry vodka or sloe gin-those memories don’t bother me. It’s the later memories, the ones of my drinking around my kids or grandkids, especially the memories at the end of my drinking, that bother me the most. I have to pull those out every now and again and feel the shame and remorse to keep me on my path, to remind me that I don’t want to turn around and go back there. I think sometime in my efforts to not beat myself up for my past, I tend to put a negative connotation on these memories and feel that I should work harder to get rid of them, but they are the memories that hold the most power for me. They are the memories, along with the new positive memories I’ve made, that keep pushing me down this path.